The first time I applied false eyelashes was a total disaster. I decided to give them a try just for fun one night because I’d seen them on a girl at school who wore them all the time. I was curious and thought maybe they’d look good on me. Well, they didn’t. The glue slid all over my eyelids and after what probably felt like a half hour, the lashes finally stayed in place. My real eyelashes were stuck together from excess glue and the lash strip was placed crooked on my eyelid. The struggle made me decide they weren’t for me mainly because I didn’t understand how the heck people got them on without all of the fuss. I later learned that false lashes don’t have to be that difficult to apply if you follow a few tips and tricks. After I got the hang of how to apply them, the process became very quick and easy. Now I really enjoy wearing them on a night out or for a special occassion. I even wear them during the day sometimes because I find they really help to pull a makeup look together and give a little something extra. Hopefully a few tips and tricks will have you well on your way to mastering the falsies. Good luck! When it comes to false lashes, one size does not fit all. Test your false lashes against the natural shape of your eye no matter what style of lash they are. It’s perfectly fine to give them a little trim if they’re too long or wide. Applying false lashes that don’t fit with your eye shape will not look attractive, trust me. After they’re trimmed, bend your false lash strips in the shape of a C and hold for a few seconds. The lash strip should follow the natural contour of your upper eyelid to adhere properly and look natural. Lash adhesive comes in different varieties and colors. Depending on what you prefer, you can purchase a striplash or brush on adhesive. Glues mainly come in white or dark, but I’d recommend going with white as it dries clear and is more forgiving if you make a mistake. There’s specific lash adhesive for individual lash application as well as lashes that have self-adhesive already applied. However, I find that glue works best to secure the lash in place. 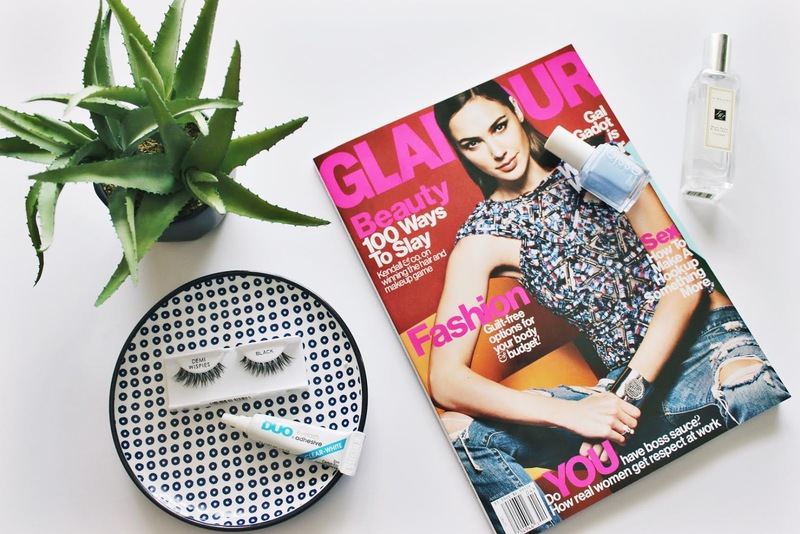 The best lash adhesive that has a pretty good reputation all round is the Duo Eyelash Adhesive. Once you’ve placed an even layer of glue on the lash strip, wait about 30 seconds or so for the glue to become tacky. If you skip this step, the glue will slid all over your lid when you apply the lash. If you’re in a rush, gently blow or wave the lash strip back and forth to allow the glue some time to dry. Grab the middle of the false lash strip with your tweezers. Tweezers will help you place the false lashes close to the lash line when you’re ready. Map out exactly where you want the lash to be placed while looking in the mirror and start by placing the lash toward the inner corner and working your way toward the outer corner. After both lashes are applied exactly how you’d like, hold them down with the back end of the tweezers and apply light pressure. Sometimes, I use my pinky finger as well to ensure both eyelashes won’t budge. You might see a few spaces between your real and fake lashes, but don’t worry! You can fill in the gaps with a black or brown liquid eyeliner to help them appear more natural. I do find that applying mascara helps to blend in my real and fake lashes, so I typically like to include this step. However, if you’d like to reuse your false lashes, I’d suggest leaving your falsies sans mascara. Once they are firmly set in place, use your eyelash curler to perk them up a bit. helpful post, I remember the first time I was trying to apply eyelashes, couldn't do it. Tweezers do help a great deal.